A while back I made a post about Marta’s UV-ink Ichi The Killer-inspired tattoo, and was asked to follow-up with exactly how it looked under UV light, fully healed. Marta just posted this wonderful follow-up picture, which gives me the perfect chance to answer that very query. And of course it looks even better with an assortment of matching UV acrylic jewelry. Marta Zdanowicz, a piercer in Warsaw, Poland, is like many piercers, a big fan of the movie and manga series Ichi the Killer, a film so obscenely violent that it has been broadly censored and remains illegal in Norway — even as a privately purchased video — even today. As you can see, this influenced the design of her “invisible tattoo” (by Aldona from Szerytattoo in Warsaw) is deeply influenced by the scars on Kakihara’s face. The UV ink healed quickly for her without problems — more quickly in fact than any of her “normal” tattoos (while she was at it she also added UV ink to the spirals on her neck, which you can click here to see, and those healed trouble-free as well — don’t miss the great sideburn bars in this picture). 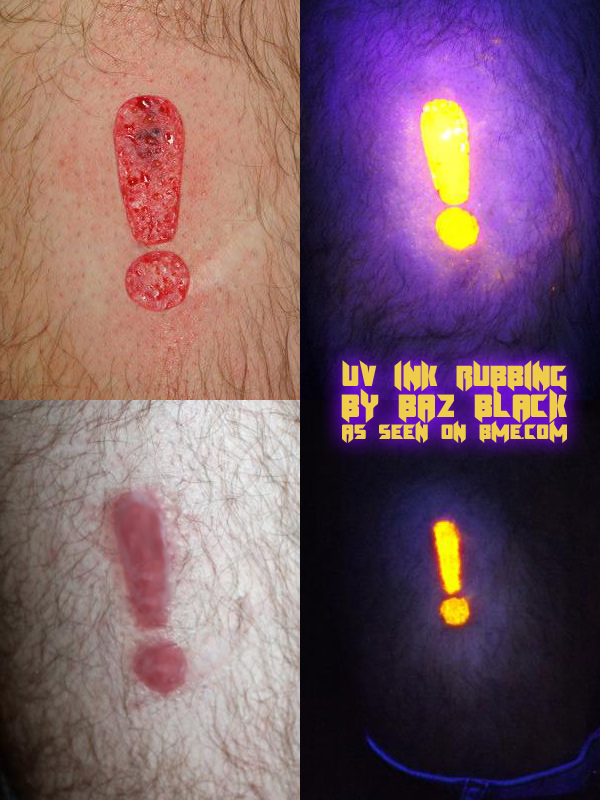 This first set of pictures shows the tattoo fresh and in its healed UV state, and in the second picture set you see it contrasted with Kakihara from Ichi the Killer. Of course when you’re talking about a tattoo that is UV ink and nothing but, the million-dollar question is always how much the UV ink is going to show up in regular light. In the first photo below you can still see it quite easily, but that photo was taken just a few weeks after being done so it is to be expected that it would still be visible. The second photo is a couple months later and you can still see it if you know where to look and what you’re seeing, but it’s much, much fainter. This is something that people should always be aware of when getting UV-only work — it is always possible that it is visible to some extent. This is both due to unavoidable issues, the minor scarring of the skin that all tattoos should be expected to cause, as well as errors by the tattoo artist such as slightly contaminating the ink with the stencil or marker used to draw the design, or metal or old ink from the tubes if the tattooist is not using single-use disposable tubes. 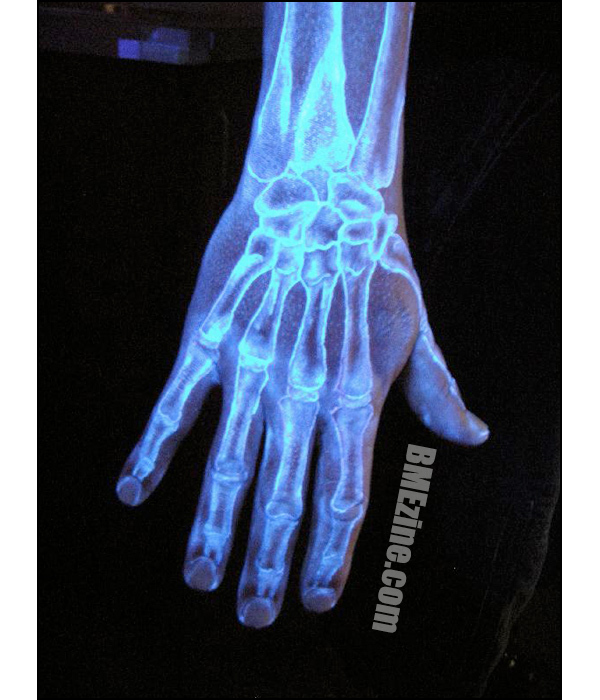 For the video game geek that has everything, a UV palm tattoo of our favorite space invader. Palm tattoos are notoriously tricky to heal, and tend to fade faster than other tattoos. Let’s hope this one manages to stick around. Tattoo by Rich Milne from Studio XIII in Edinburgh. Well, if the science behind magnets confuses you, Nilrem is here to help you explain just how these miracles work. The magnets themselves are a couple of years old, but recently Nilrem went to visit Tom C from Broadway Tattoo Lounge in South Amboy, NJ to get the magnetic fields added. What’s great is that instead of just getting black lines, he ended up getting blue UV ink. And with UV ink comes the obligatory black light photo. You can see how fresh they are by the little splashes of ink that haven’t been cleaned up yet. So not only is he showing how magnets work, he’s also showing off even more sciencey goodness with the UV ink. Jackie Rabbit has quickly established herself as an artist to watch out for. We’ve seen a lot of her work on ModBlog over the past few months, and for good reason. Her art doesn’t always fit into one genre, yet it all comes out looking great. This one in particular is an interesting one as it’s her first time using UV ink. Sadly the darkened image is a little blurry, which I’m assuming is the result of the low light, however you can see that she used the UV ink to highlight the bodies of the fireflies and the edges of the leaves. For a first attempt, I’d say she did a great job. It’s been a while since we’ve seen UV ink tattoos on ModBlog, and while there have been advances in the inks, I’m sure there are still two sides to the debate as to whether or not to use them. Putting the debate to the side, this UV ink chest piece sent in by Kreynold is pretty impressive. If you can’t read the writing it says “I am Blessed” above a crown. We kicked off the week with these UV ink tattoos by Stephanie Campbell at Dragon FX Kingsway in Edmonton, Alberta, but the question remained among many: What do these suckers look like when not under the glow of one of your fancy ’70s blacklights? Well, Stephanie checked back in with these shots to illustrate the difference. Check out the difference after the jump. Good day, ModBloggers! Hope you’re all refreshed and bright-eyed and sobered up or whatever from the weekend. Let’s kick things off this week with these UV tattoos by Stephanie Campbell at Dragon FX Kingsway in Edmonton, Alberta. 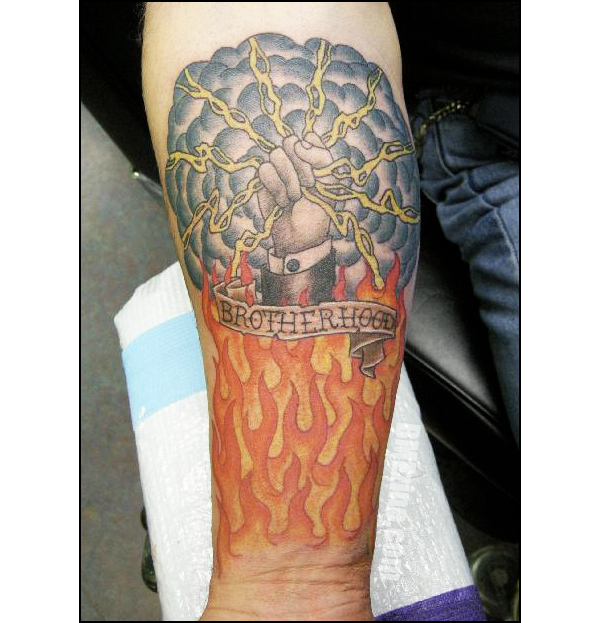 We know the jury is still out on UV tattoos to an extent, what with the potential unpredictability of the ink used, but we’ll save the moralizing for now (for once?) and just enjoy some fun, well-executed work. More after the jump.